The freedom of religion and economic prosperity of the harbour city of Livorno attracted many Jewish merchants, most of whom were of Sephardic descent. In the first half of the eighteenth century some 4,500 Jews lived in Livorno, making the Jewish community in the city the largest and most influential in Italy. 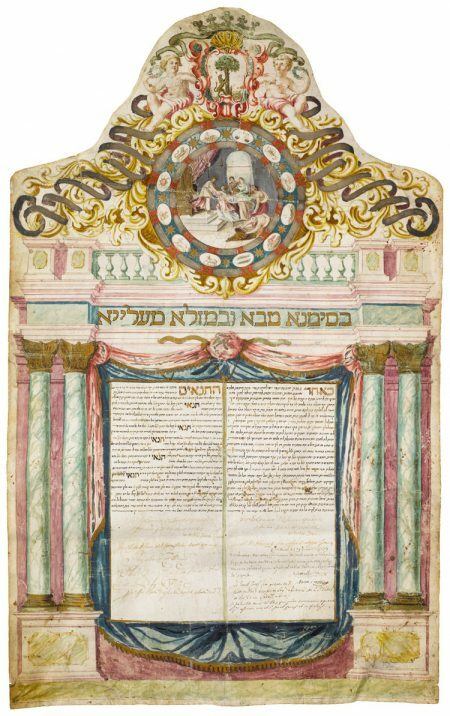 This ketubbah, with its rich baroque designs, shows the extent to which the taste of the Jewish community was influenced by the surrounding non-Jewish culture. Dowry: 1,500 coins (piezas) of which 1,000 in cash and 500 in bed linen; increment: 750 piezas.